Heavy-duty pull-up device This is a great power from the pull device, can be used to remove the steel pile on the site can also be used to pull the long steel sheet piles. 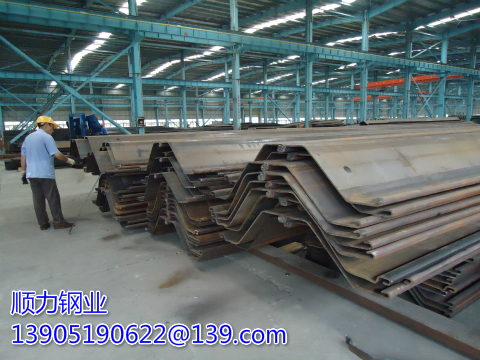 At present, this equipment can provide about 4000kN on the pull force, operation, the sheet pile on both sides of the need for at least 1.5m of work space, and the need for a hard support. Pull from the open end of the pile and operate backwards along the pile. HZ-type pile and high-modulus pile composite wall construction High-modulus wall is a special rolling of the main pile or box-type pile and the combination of standard steel sheet pile. The main pile is the main structural components, connected by the middle auxiliary pile. The side of the HZ pile is "straight plane", which is one of the most important and effective structural systems for the length of up to 33m project and deepwater berth. The HZ pile can only be used by experienced and maritime construction equipment Of the contractor construction, the general use of the screen method of piling, to set up a pile before the first pile in the main pile, in the short stubs before the key is to make the main pile to play accurate. In this regard, some temporary assistance measures, such as the guide around the purlin cable, the main pile of the line and support the piling are very helpful. The construction of these two types of piles and ordinary pile is not the same as the main steel sheet piles and auxiliary pile need to use different pile hammer, piling process and other details can refer to ArcelorMittal company published "Hz-type pile composite wall" HZ-type pile system to a lot of hot-rolled products organically combined in the correct construction of the premise, is the best integrity of the system. Other composite systems are also available on both sides of the pipe with welded steel and welded together in the box-type piles, etc., in these cases all the need for welding and steel sheet pile length are required to implement the appropriate standards to achieve a high standard of technology and testing In any case, the auxiliary pile must consist of at least two steel piles at least three) The locking port can withstand the additional stresses generated by the pressure between the main piles. The AZ Pile with the Larsen lock is the most suitable secondary pile in the composite wall: the amount of the steel sheet pile is one ton of piles in the dense sand before the lock in the asphalt-based caulking agent to avoid locking.